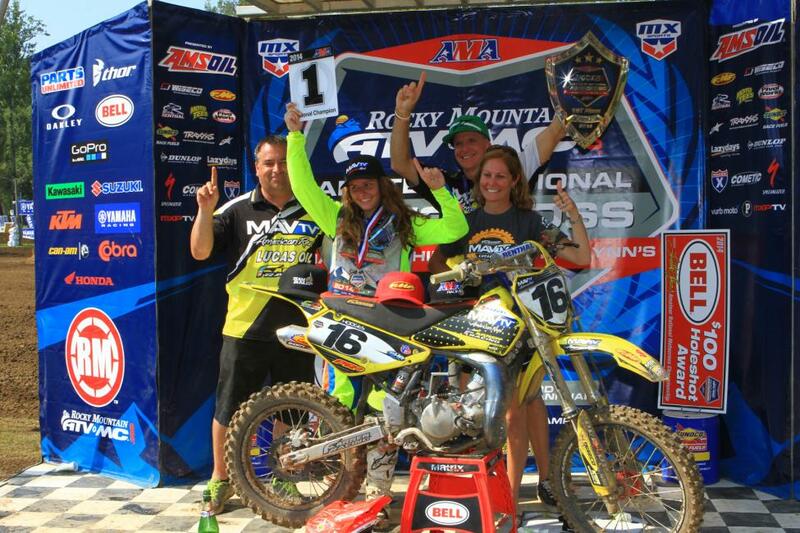 The 33rd Annual Rocky Mountain ATV/MC AMA Amateur National Motocross Championship presented by AMSOIL came to a conclusion on Saturday with the fifth and final day of racing in Hurricane Mills, Tennessee. Thirty-six National Championships were awarded upon completion of the third set of motos with six dominant riders emerging victorious in two different classes. Perhaps the rider who finished with the highest honors after the week’s racing was Factory Connection/AMSOIL Honda rider of RJ Hampshire, who managed to win all six motos that he entered in both the 250 A and Open Pro Sport classes, along with two Bell Holeshot Awards. Hampshire’s impressive performance throughout the week led up to the highest accolade of them all, the coveted AMA Horizon Award that’s given to the A rider who shows the most promise as they prepare to enter the professional ranks. 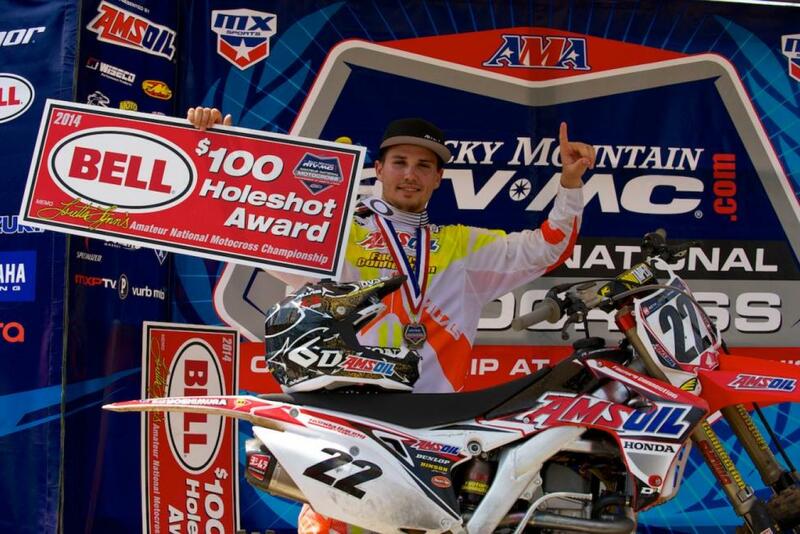 The newly crowned 2014 AMA Horizon Award winner plans to compete in the upcoming round of the Pro Motocross Championship at Unadilla. 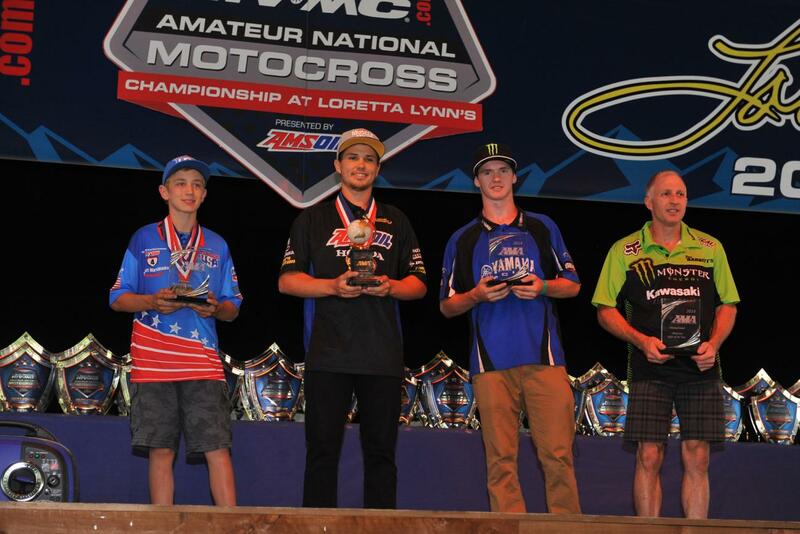 The AMA Motocross Amateur Rider Award, which is new for 2014, is presented to an outstanding non-A-class rider at the AMA Amateur National Motocross Championship. It is designed to recognize those who are ready to make an immediate impact in A-class competition. This year’s recipient, Tristan Charboneau, scored a perfect 1-1-1 score en route to a 450 B title, in addition to an impressive 2-1-2 performance to capture the 250 B championship as well. 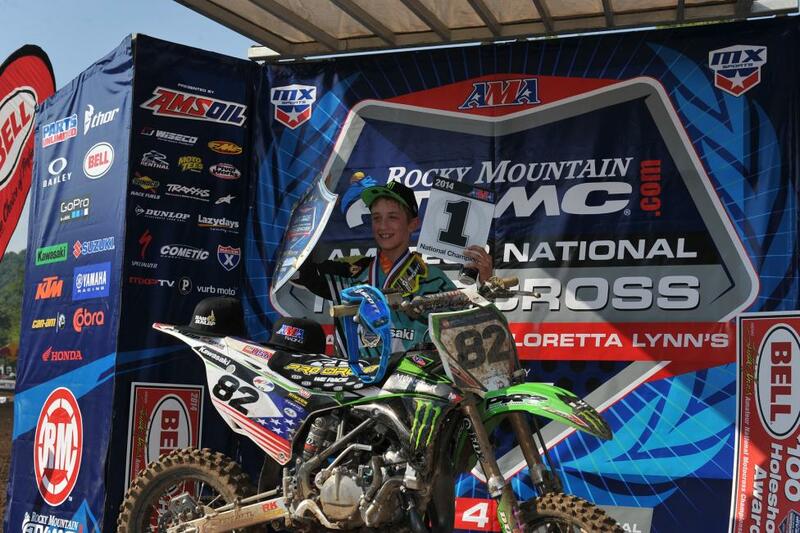 The AMA Motocross Youth Rider Award goes to a rider under the age of 16 chosen for his or her performance in the youth classes at the motocross nationals. Youth riders who also participate in amateur classes will be considered, but only their youth class results will be factored into the selection. This year’s recipient of the in the Youth division is Garrett Marchbanks, champion of both Mini Sr 1 (12-13) and Mini Sr 2 (12-14). The AMA Motocross Vet/Senior Rider Award acknowledges an outstanding rider over the age of 30 at the AMA Motocross National Championships. Results from all classes ridden are taken into consideration in selecting the winner. In an ultra-competitive Vet division, John Grewe topped both the Senior 40+ and Senior 45+ classes to capture not only two titles, but also the coveted Vet/Senior Rider Award. In the racing department, Saturday’s finale showcased some of the most exciting battles of the week. Tristan Charboneau was flawless in 450 B, going 1-1-1 to capture the championship, with Timmy Badour (3-5-4) and Blake Neiheiser (5-7-3) rounding out the podium. In 250 B Limited, Bradley Taft finished on the podium in the final moto to outlast Ryan Surratt (2-4-1) and Chase Bell (4-2-4). Jon Ames and Luke Purther entered the final day tied in Schoolboy 1 (12-16) B/C. Both riders had to work through the pack in order to keep their championship hopes alive, and a late mistake from Purther handed the title to Ames in the end. Jake Masterpool (4-3-1) and Justin Cooper (3-12-2) also took advantage of Purther’s crash to finish atop the podium. 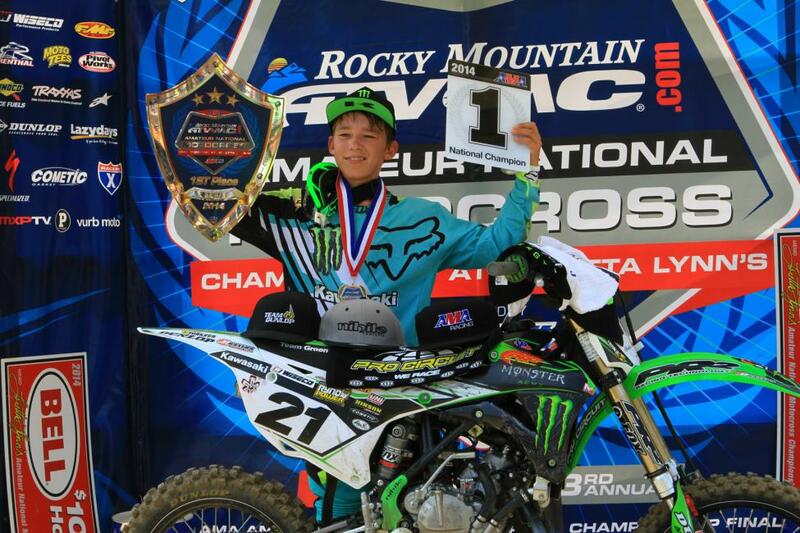 Mini Sr. 1 (12-13) belonged to the ultra fast Monster Energy/Team Green Kawasaki of Garrett Marchbanks, who made it a clean sweep on Saturday. Jalek Swoll (4-2-2) and Brock Papi (2-3-4) finished second and third. Austin Forkner ended his minicycle days—he’s moving to the 250F—with a clean sweep of Super Mini 2 over teammate Sean Cantrell (2-2-2) and Jordan Bailey (3-4-4). Hannah Hodges dominated her third straight moto on Saturday to make it a clean sweep in Girls (12-16). Danielle Grigoletti (3-2-2) and Gracie Van Horn (2-3-3) joined Hodges atop the podium. In Girls Jr. (9-13), Jordan Jarvis claimed her third straight win to capture the championship, while Jamie Astudillo (2-3-3) and Karly Morgan (3-4-2) finished second and third, respectively. Bad luck struck for Kaitlyn Morrow in the third moto of Women 14+, as she went down early on and wasn’t able to finish the moto. Mackenzie Tricker (1-2-5) took full advantage and won the championship, her second straight title, over Marissa Markelon (4-5-2) and Brandy Richards (9-3-1). In Vet racing, John Grewe and Trampas Parker had traded moto wins entering the third and final Senior 45+ moto. It was a winner-take-all affair on Saturday and it was Grewe who edged out Parker in the final duel at the Ranch. Barry Carsten (4-3-3) would round out the podium with third overall. Grewe went on to also capture the Senior 40+ championship after a good battle with two-time moto winner Tony Lorusso, who went 1-9-1 for third overall, and the second place finisher of Gregory Pamart (5-2-3). In Masters 50+, Rodney Smith made it interesting by winning the final moto, but Earl May was able to capture the championship following two moto wins earlier in the week. One of the best championship battles of the week to place in Vet 30+ B/C. 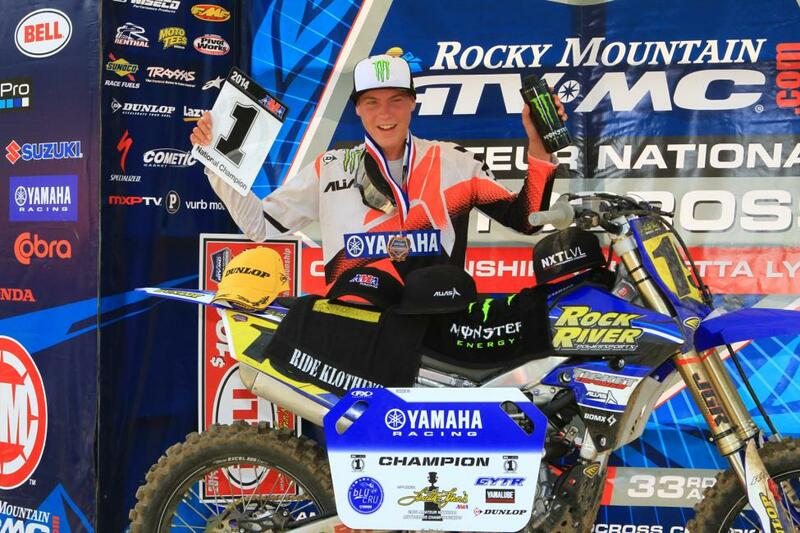 Entering the final moto Saturday, both Reid Edwards and Chad Murphy had captured a moto win in the class. The slugfest continued in Moto 3, as Edwards passed Murphy just before the white flag dropped, but Murphy struck back on the final lap and won by just 1.03 seconds. 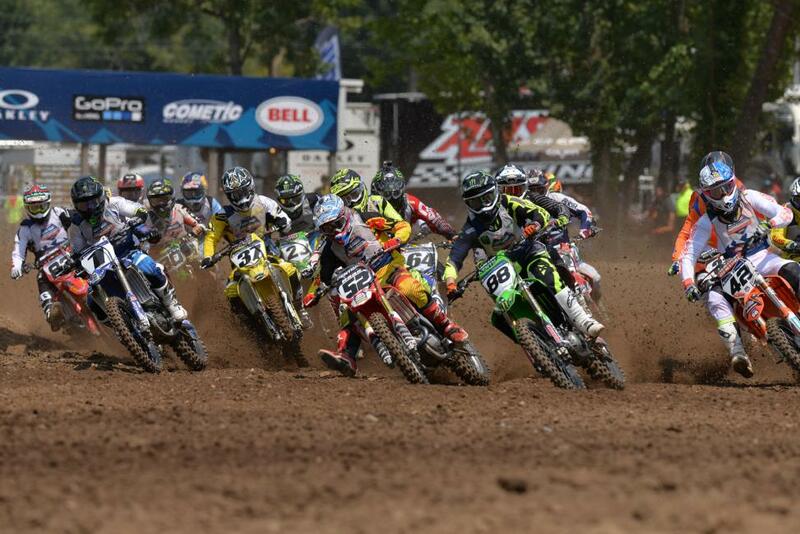 In 250 C Limited Braden O’Neal survived a fourth in the final moto to win the championship. Cole Conatser (1-2-6) finished second, with Chad Saultz (4-9-1) in third. Draken Jaynes (1-4-2) would win the final moto of the day—250 C—over Justin Boyd (4-3-1) and Nicholas Rolando (3-6-4). RacerTV.com provided over 30 hours of LIVE stream coverage of racing throughout the week and the archived footage is now available for viewing HERE. Complete results from the 2014 National Championship can be found HERE.